This is a living, curated list of documents and links related to UK Government e-government and digital government initiatives since the early 1990s. More will be added as and when time allows. Wherever possible the original document is available for online viewing or download from this site for convenience. Some links are provided where documents are not applicable. All copyrights acknowledged. Report of the Machinery of Government Committee. (“The Haldane Report”). Ministry of Reconstruction. HMSO, 1918. Okay, so this report from 1918 appeared well before the remainder of documents on this site – but it raises issues that remain relevant today, namely how government might better be configured to work most effectively. Technology has provided us with options to completely rethink the configuration of government that simply didn’t exist at the time of Haldane’s Report. Information Superhighways. 22 December 1994. Research Paper. House of Commons Library. The UK National Information Infrastructure. May 1995. Parliamentary Office of Science and Technology (POST). UK Teleworking. June 1995. Parliamentary Office of Science and Technology (POST). Government Direct. A Prospectus for the Electronic Delivery of Government Services. 1996. Cabinet Office. And below are the images from the front cover of the CD-ROM, the inside forward by the Minister, and the gatefold providing more details including of where to send comments. The interactive CD-ROM enabled users to type in their own comments and notes, which could later be sent back as part of the consultation. Intelligent forms project (“iForms”). Smartcards and e-signatures were introduced in late 1997. This Smartcard News from December 1997 contains details about the work. iForms enabled a user to fill in one single form and sign it digitally with their smart card. Appropriate data from the form was then parsed and sent to relevant departments. In the case of the initial iForms project, the programme took numerous paper forms related to registering for self employment and turned them into a single smart (“intelligent”) online form, significantly reducing the amount of repetitive data previously required from the user. The data from it was sent to three different departments – Inland Revenue, HM Customs and Excise, and the Department of Social Security’s Contributions Agency. 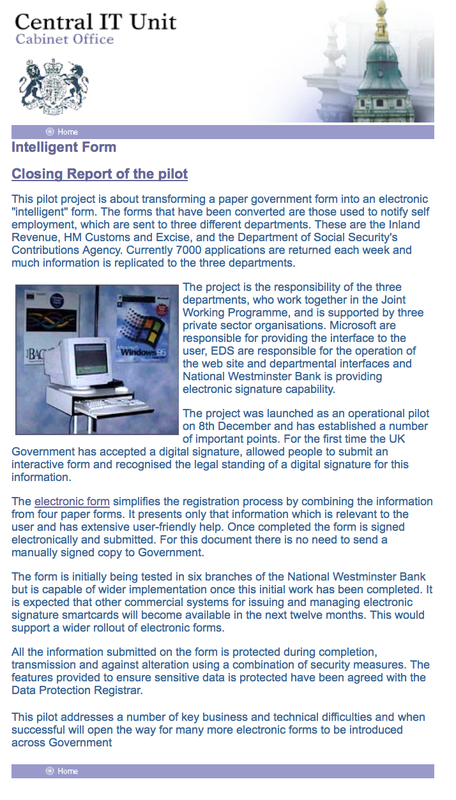 This 1997 work is an early example of the UK government using a third party identity provider, namely NatWest bank, for access to online public services – work that is still in progress some 20 years later. Electronic Government. February 1998. Parliamentary Office of Science and Technology (POST). Electronic Government: the view from the queue. Comprehensive research into potential customer take-up of online government services. October 1998. Cabinet Office. Modernising Government. March 1999. Cabinet Office. Electronic Service Delivery of Government Services. Progress Report — Electronic Government 25% Target. May 1999. Cabinet Office. Portal Feasibility Study. 29th June 1999. PA Consulting Group for the Central IT Unit, Cabinet Office. e-commerce@its.best.uk. September 1999. A Performance and Innovation Unit Report, Cabinet Office. Professional Policy Making for the Twenty First Century. September 1999. Report by the Strategic Policy Making Team, Cabinet Office. Government on the Web. December 1999. National Audit Office. Smart Card Framework Version 1.0. December 1999. Central IT Unit (CITU). UK Government Portal: Change of Address Demonstrator Design. January 2000. Compaq, for the Central IT Unit, Cabinet Office. Assessing Attitudes to the Change of Address Function. January 2000. Government Portal Research. MORI for the Central IT Unit, Cabinet Office. Wiring it up. Whitehall’s management of cross-cutting policies and services. January 2000. A Performance and Innovation Unit Report. Cabinet Office. CITU Portal Demonstrator. Lessons Learned. 2000. Central IT Unit, Cabinet Office. Government to speed up introduction of online services. Prime Minister’s announcement, Thursday 30 March 2000. Sets out a revised target of all government services being online by 2005 rather than 2008.
e-government. A Strategic Framework for Public Services in the Information Age. April 2000. Central IT Unit, Cabinet Office. e-Europe 2002. An Information Society For All. Action Plan. 19-20 June 2000. Council of the European Union / Commission of the European Communities. e.gov. Electronic Government Services for the 21st Century. September 2000. A Performance and Innovation Unit Report. Cabinet Office. UK online Annual Report. September 2000. Cabinet Office. e-government Authentication Framework. December 2000. Office of the e-Envoy, Cabinet Office. Citizens First. Modernising Government Annual Report. 2000. Cabinet Office. Successful IT: Modernising Government in Action. Review of Major Government IT Projects. 2000. Cabinet Office. Security. Framework for Information Age Government. 2000. Central IT Unit, Cabinet Office. Privacy and data sharing. Framework for Information Age Government. 2000. Central IT Unit, Cabinet Office. Groundbreaking new project to deliver secure internet transactions. Cabinet Office, 7 February 2001. Press release about the Government Gateway – federated third party identity and cross-government interoperability of transactions through XML and digital signatures. e-Government Metadata Framework. May 2001. Office of the e-Envoy, Cabinet Office. 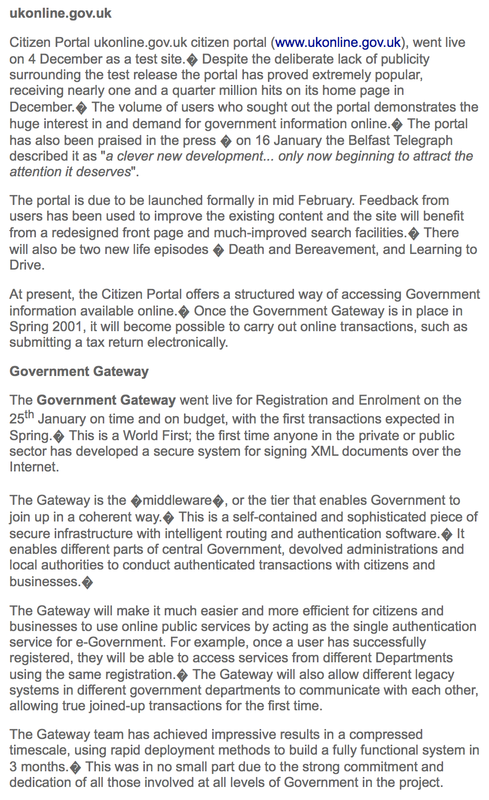 Government Gateway Overview. (Powerpoint). November 2001. Office of the E-Envoy, Cabinet Office. Registration and authentication. E-government strategy framework policy and guidelines. 2 November 2001. Cabinet Office. e-Enabling the Voluntary and Community Sectors. November 2001. Hall Aitken on behalf of the Active Communities Unit, the Department for Education and Skills, and the Office of the e-Envoy. Wiring it up. Progress report. 2001. Cabinet Office. e-Services Development Framework. 5 December 2001. Office of the e-Envoy, Cabinet Office. Privacy and data-sharing. The way forward for public services. April 2002. A Performance and Innovation Unit Report. Cabinet Office. Better Public Services through e-government. 4 April 2002. National Audit Office. Government on the Web II. 25 April 2002. National Audit Office. 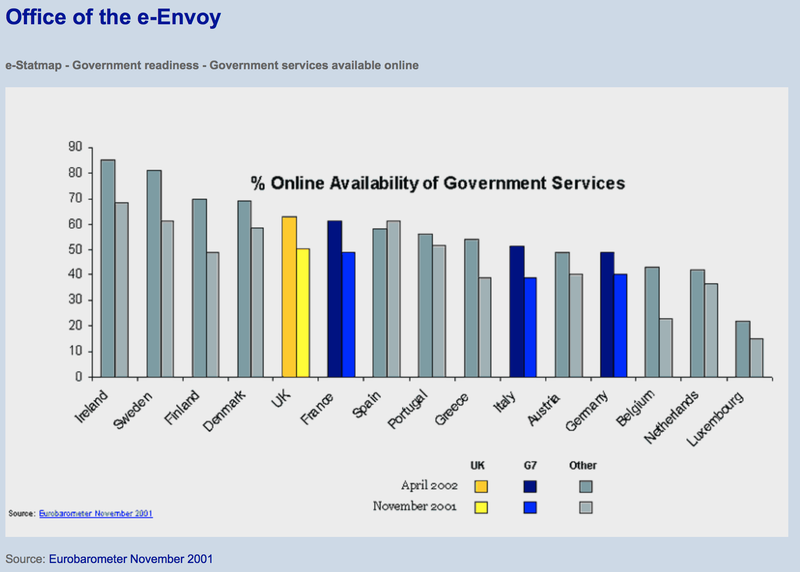 Percentage of government services available online. April 2002. Office of the e-Envoy, Cabinet Office. Summary of the UK e-Government Programme. March 2002. From “White Paper: 21st Century Literacy in a Convergent Media World“, Bertelsmann Foundation and AOL Time Warner Foundation. Open Source Software use within UK Government. 15th July 2002. Office of the e-Envoy, Cabinet Office. Trust Services. e-Government Strategy Policy Framework and Guidelines. Version 3.0, September 2002. Office of the e-Envoy, Cabinet Office. Registration and Authentication. e-Government Strategy Policy Framework and Guidelines. Version 3.0, September 2002. Office of the e-Envoy, Cabinet Office. Channels framework. Delivering government services in the new economy. 30th September 2002. Office of the e-Envoy, Cabinet Office. Government Gateway. Presentation to the Caribbean Islands Delegation. (PPT). November 2002. e-Delivery Team, Cabinet Office. Overview of the current state of play of common platforms and services as of 2002. HMG’s Minimum Requirements for the Verification of the Identity of Individuals. Version 2.0. January 2003. Office of the e-Envoy, Cabinet Office. HMG’s Minimum Requirements for the Verification of the Identity of Organisations. Version 2.0. January 2003. Office of the e-Envoy, Cabinet Office. Central e-Government Products: Current and Planned. January 2003. E-Delivery Team, Cabinet Office. Towards an agreed cross-government services and information architecture. Working document, April 2003. Office of the e-Envoy, Cabinet Office. Policy Framework for a mixed economy in the supply of e-government services. A consultation document. May 2003. Office of the e-Envoy, Cabinet Office. Measuring the Expected Benefits of e-Government. 29th August 2003. HMT. Interoperability Presentations. 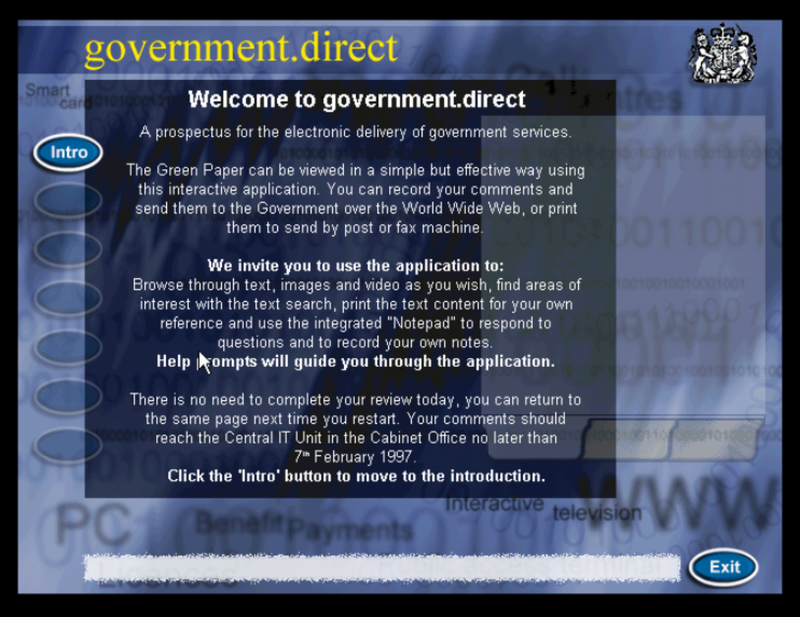 September 2004. e-Government Unit, Cabinet Office. Invest to Save Budget (ISB) Pilots Product Guide. (Microsoft Powerpoint document) Version 1.0, 3rd October 2003. Office of the e-Envoy, Cabinet Office. (Part of the “build once, use many times” common re-usable components for government designed to accelerate online government service delivery). Open Source Software use within UK Government. 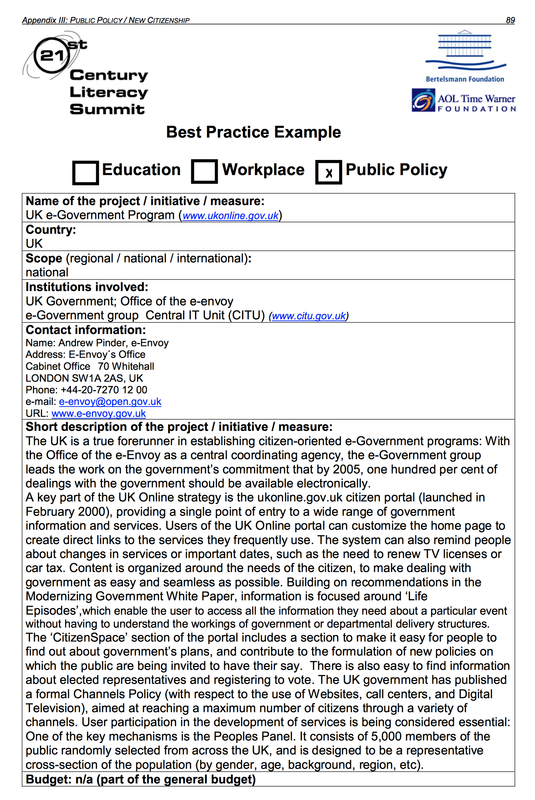 28 October 2004. e-Government Unit, Cabinet Office. Improving IT Procurement. 2 November 2004. National Audit Office. e-Government Interoperability Framework (e-GIF or eGIF). Version 6.1. 18 March 2005. e-Government Unit, Cabinet Office. UK Government Gateway Frequently Asked Questions. 5 April 2005. e-Delivery Team, Cabinet Office. Interactive Guide to Connected Government. 19th August 2005. e-Delivery Team, Cabinet Office. Common Infrastructure – Payments Engine. 2005. e-Delivery Team, Cabinet Office. A flyer for the pan-government payments engine. Transformational Government. Enabled by Technology. November 2005. Cabinet Office. Transformational Government. Implementation Plan. November 2005. Cabinet Office. Payment Engine Business Overview. 5th July 2006. Cabinet Office. Liberty Alliance Awards: The UK Cabinet Office Government Gateway Project. October 18th 2006. Service transformation: A better service for citizens and businesses, a better deal for the taxpayer. December 2006. Sir David Varney. HMT. The Government Gateway. UK Best Practice on Infrastructure and Identity Management. April 2007. E-Delivery Team, Cabinet Office. The Power of Information. An independent review by Ed Mayo and Tom Steinberg. June 2007. Challenges and opportunities in identity assurance. March 2008. Report by Sir James Crosby for the Chancellor. Employee Authentication Services (EAS). A potential pan-government service. May 2008. (Presentation). CIO Group, Department for Children, Schools and Families. Data Handling Procedures in Government: Final Report. June 2008. Cabinet Office. 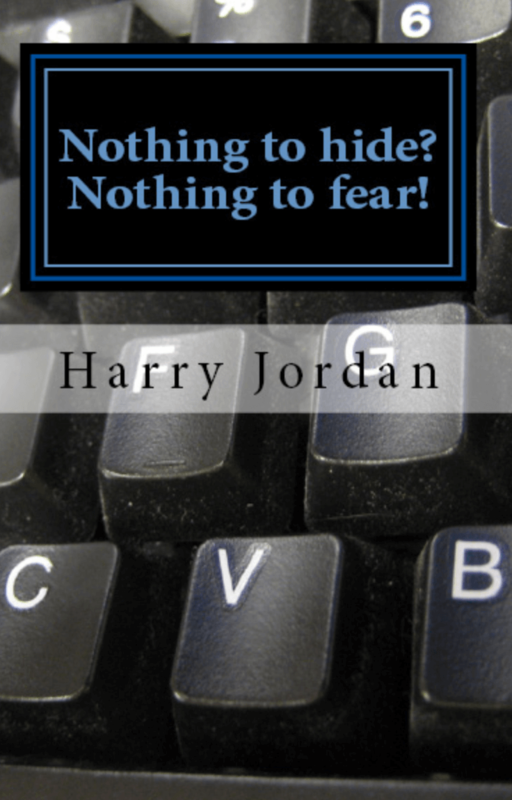 Review of information security at HM Revenue and Customs. June 2008. Kieran Poynter for HMT. The Government Gateway. The Government Gateway in support of local government objectives. 2008. (Presentation). DWP. The UK Government Gateway Remote Authentication. 24th October 2008. (Presentation). DWP. Introducing the National Identity Service. How the Service will work and how it will benefit you. April 2009, Identity and Passport Service. Power of Information Taskforce Report. February 2009. Report prepared for the Cabinet Office. Digital Britain. June 2009. Department for Business Innovation and Skills and Department for Culture, Media and Sport. Data Centre Strategy, G Cloud and the Apps Store. Mobilisation ‘Strawman’. 31 July 2009. Cabinet Office. Authentication. 30th September 2009. (Presentation). DWP. Putting the frontline first: smarter government. December 2009. Chief Secretary to the Treasury. Government ICT Strategy. Smarter. Cheaper. Greener. December 2009. Cabinet Office. Trust in electronic transactions: an opportunity to change the landscape. December 11th 2009. Paper associated with the workshop run by the Technology Strategy Board at the BIS Conference Centre. Cabinet Office Structural Reform Plan. June 2010. Cabinet Office. 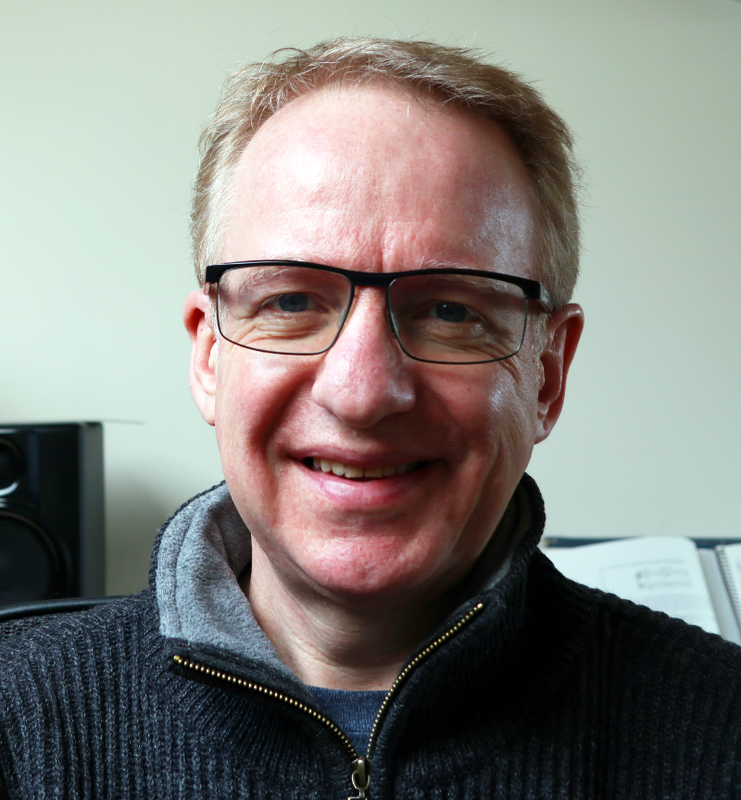 Directgov Strategic Review – Executive Summary. 29 September 2010. Directgov 2010 and Beyond: Revolution Not Evolution – Letter from Martha Lane Fox to Francis Maude. 14th October 2010. Francis Maude’s reply to Martha Lane Fox’s letter. 22 November 2010. Better for Less. How to make Government IT deliver savings. 7th December 2010. The network for the post bureaucratic age. ICT in government. Landscape review. February 2011. National Audit Office. Government cloud strategy. March 2011. Cabinet Office. Greening government ICT strategy. March 2011. Cabinet Office. Privacy and Consumer Advisory Group. July 2011. GDS online page. Government ICT Strategy — Strategic Implementation Plan. October 2011. Cabinet Office. Digital Britain One: Shared infrastructure and services for government online. December 2011, National Audit Office. Open Standards Principles. For Software interoperability, data and document formats in government IT specifications. 1 November 2012. Cabinet Office. Government Digital Strategy. November 2012. Cabinet Office. Future Identities. Changing identities in the UK: the next 10 years. Foresight, Government Office for Science. January 2013. The impact of government’s ICT savings initiatives. 23 January 2013. National Audit Office. End User Device Strategy: Design and Implementation v1.2. Cabinet Office. February 2013. End User Device Strategy: Interoperability Standards v1.2. Cabinet Office. February 2013. End User Device Strategy: Security Framework and Controls v1.2. Cabinet Office/CESG. February 2013. Digital Britain 2: Putting users at the heart of government’s digital services. March 2013, National Audit Office. Government Service Design Manual. GDS online page. April 2013. Managing Identity Online. Parliamentary Office of Science and Technology (POST). Number 434. April 2013. Government as a Platform. GDS Service Design Manual online page. May 2013. More than just websites. Sir Jeremy Heywood, Cabinet Secretary and Head of the Civil Service. Blog. 26 September 2014. Identity Assurance Principles. V3.1. Privacy and Consumer Advisory Group (PCAG). 30 September 2014. Government as a Platform: the next phase of digital transformation. GDS Blog. 29 March 2015. Introducing GOV.UK Verify. GDS, Cabinet Office. June 2015. Preparing for Government as a Platform. GDS, Cabinet Office. June 2015. Making payments more convenient and efficient. GDS, Cabinet Office. July 2015. GDS Mission – the next phase. Minister Matt Hancock MP’s blog. GDS, Cabinet Office. August 2015. Building a platform to host digital services. GDS, Cabinet Office. September 2015. What’s happening with data. GDS, Cabinet Office. September 2015. Government as a platform for the rest of us. GDS, Cabinet Office, October 2015. Good Practice Guide No. 44 Authentication and Credentials for use with HMRC Online Services. First Public Release. CESG / Cabinet Office. Good Practice Guide No. 45 Identity Proofing and Verification of an Individual. October 2015. First Public Release. CESG / Cabinet Office. Good Practice Guide No. 46 Organisation Identity. October 2015. First Public Release. CESG / Cabinet Office. Status tracking – making it easy to keep users informed. GDS, Cabinet Office. October 2015. Introducing GOV.UK Pay. GDS, Cabinet Office. October 2015. Government Transformation Strategy. 9 February 2017. Cabinet Office. Digital Economy Act 2017. UK Government. Data Protection Bill 2017 (as introduced). Published 14 September 2017. Department for Digital, Culture, Media and Sport (DCMS). Digital Economy Act 2017. DCMS. In addition to the government policy-related documents above, the following sites, documents and books provide additional relevant information and research. The Government Gateway federated identity and messaging broker mentioned in a Microsoft newsletter from 2001, demonstrating an early use of agile in government: the federated identity broker and cross-government message handling system was built and delivered between October 2000 and January 2001. It provides an open-standards SAML and digital certificate hub for identity federation (later to include chip and PIN cards), as well as a transaction/messaging system using open and authenticated APIs to enable the flow of data between government departments and between citizens, businesses and government. Summary comparison table of the original Government Gateway SAML hub and the GOV.UK Verify SAML hub, showing differences in functionality and scope. Wardley Mapping. Wardley Mapping (also called Value Chain Mapping) is a technique of environment visualisation that supports the development of meaningful strategy. It can also help with deciding where to consume existing products and services, and where bespoke build is required. A Government-wide Enterprise Architecture. How To Avoid Indigestion When Attempting To Eat An Elephant. 2003. Alan Mather, Director, e-Delivery Team, Cabinet Office. This provides valuable insight into the attempts to develop common, shared infrastructure and platforms for the whole of government in the period c.2001-2003. Government on the Web. This site is dedicated to improving knowledge and understanding of digital era government. This site is run jointly by the LSE Public Policy Group (London School of Economics and Political Science) and the Oxford Internet Institute (University of Oxford). Digital Era Governance: IT Corporations, the State, and E-Government. (Book). 19 Jun 2008. Patrick Dunleavy, Helen Margetts, Simon Bastow, Jane Tinkler. 12 Years of e-Government: A Review. December 2009, released July 2010. Centre for Technology Policy Research. The Obama Effect: the US IT Revolution and the UK. November 2009, released July 2010. Centre for Technology Policy Research. UK public sector IT. October 2009, released July 2010. Centre for Technology Policy Research. Digital government, open architecture and innovation: why public sector IT will never be the same again. Journal of Public Administration and Management. September 2012. Mark Thompson and Jerry Fishenden. The Gubbins of Government. Mark Foden. 18 June 2013. A clear 3:17 minute articulation of the nature of Government as a Platform. (Predates the GDS version above – in “Government as a Platform: the next phase of digital transformation” – by the best bit of 2 years. And does a better job). 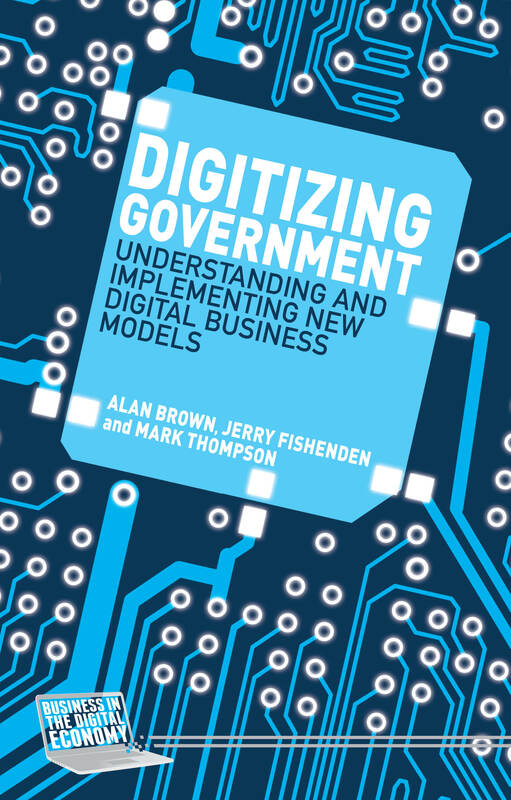 Digitizing Government: Understanding and Implementing New Digital Business Models. (Book). 1 Dec 2014. Alan Brown, Jerry Fishenden, Mark Thompson. Great Ideas in Theoretical Computer Science Summer 2013. Lecture 9: Zero-Knowledge Proofs. Lecturer: Kurt Mehlhorn & He Sun. A useful introduction to zero knowledge proof, something anything policymaker working with identity and data issues needs to understand.